It’s not a secret that today many famous watch brands working with a particular sports team or sponsor events related to the world of sports. This is, on the contrary, not only inspires athletes to reach new heights, and watchmakers to create new original models. One of these brands is a Swiss digging Oris, which is the official representative and partner of the racing classic cars RAID. Successful collaboration was noted the release of the new chronograph – RAID 2012. The idea of a clock is not accidental: the inspiration was the car – winner of races RAID Suisse-Paris in 2011 – 1942 Cadillac 62 Series. 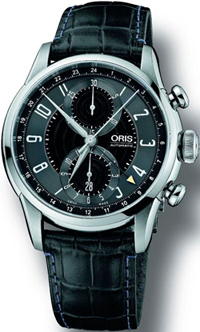 Chronograph, designed by skilled hands of masters brand Oris, presented in a classic style, with an indicator of the second time zone in 24-hour format. Gray-black dial features Arabic numerals coated with fluorescent material Superluminova, two counters at 12 and 6 hours, 4 arrows, one of which is provided with a yellow tip to indicate a second time zone. The other three arrows carry indication of hours, minutes and seconds. The company logo is located at the Oris 3:00 mark. The counter at 6 o’clock is the date aperture. Dial ending double domed sapphire crystal with anti-reflective coating on the inside. The original dial is inserted into a round stainless steel case. The back cover is decorated with the logo race RAID Suisse-Paris. Watch is water resistant to 3 bar. New product is built on the basis of the automatic mechanism with the function of the hours, minutes, seconds, chronograph, date aperture, and a second time zone indicator. The model comes on a black leather strap with a folding clasp in stainless steel. Buy watches Oris Raid 2012 Chronograph can be in a luxury wooden box. Issue of new items is limited – 500. In Switzerland, the watch will be priced at 3,900 Swiss francs.